A host of South American nations including Brazil have supported Bolivian President Evo Morales in expressing outrage at the rerouting of his plane. The presidential plane was held up in Europe after rumours that US whistleblower Edward Snowden was on the jet. 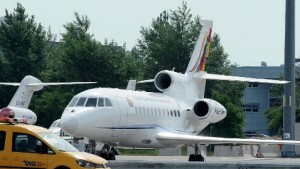 Portugal, Italy, Spain and France denied the Bolivian plane access, before it was forced to land in Austria – it remained in Vienna for at least 14 hours. Morales met with counterparts from the Union of South American Nations (UNASUR) late on Thursday to discuss the diplomatic row. Brazil was represented at the meeting by President Dilma Rousseff’s top international adviser, Marco Aurelio Garcia. Garcia traveled to Cochabamba with Brazilian government officials. President Rousseff has said the incident would have ramifications on the EU-Mercosur trade talks. “The embarrassment to President Morales hits not only Bolivia, but all of Latin America,” said Rousseff. “It undermines the dialogue between the two continents [Europe and South America] and possible negotiations between them,” she added. Mercosur is a Latin American bloc that includes Brazil. “Surely, the empire and its servants have fallen in this situation, but this is not a time for empires,” Morales said before the meet. The Bolivian president said the United States pressured European nations into the provocation.